Cell-U-Loss supports the healthy elimination of water, aids in promoting the appearance of healthy skin and the healthy activity of the urinary tract. Support healthy elimination of water through the kidneys. Promotes healthy activity of the urinary tract. Helps maintain the appearance of healthy-looking skin. Contains herbs traditionally used to support fluid balance. Helps to promote the healthy activity of the urinary tract. Helps remove excess water and toxins from the body. An excellent source of Vitamins A and C.
Traditionally used to support fluid balance. Central to the production of energy and the functioning of nerves and muscles. The most abundant mineral in the body, providing strength for the skeleton. Cell-U-Loss is especially targeted at people who are more prone to poor circulation which in turn leads to fluid retention. This unhealthy retention of water sometimes presents itself as swollen feet. This product will support the weight management for this particular group of people. The minerals in Cell-U-Loss are important for maintaining the electrolyte balance in your body. 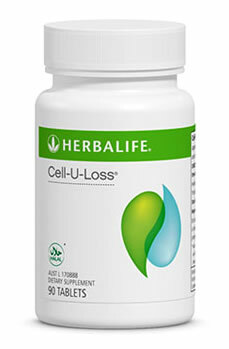 The minerals in Cell-U-Loss are important for maintaining the electrolyte balance in your body. Electrolytes are inorganic salts or complex molecules that separate into positively charged ions when dissolved in water. These ions are responsible for numerous physiological activities and excess levels are regularly excreted in the urine. Electrolytes play a key role in maintaining the system that regulates water balance. Therefore low levels of electrolytes have been added to replace any that may be lost with any increased urinary output.